This creepy black spider crawled out of a rodent hole. A few weeks ago two students were at work at a research site in central Maryland. Upon spying a slight movement in an abandoned rodent hole, one budding entomologist asked his senior partner “Is this the kind of hole a big spider might live in?” As the other student stooped to examine the burrow, a gorgeous southern black widow spider popped out of the hole. This triggered a momentary rush of adrenaline in both students. Another name for this spider is hourglass spider due to the bright red hourglass-shaped mark on the underside of the abdomen. The black widow is arguably the most dangerous species in the United States. Its venom contains a very potent neurotoxin that ranks in toxicity right up with rattlesnake venom. A saving grace for us is that the widow injects a very small dose of toxin with its bite. There are five species of widows in the United States and they are found in every state except Alaska but mostly in southern and western states. Widows spin loose webs in protected places such as under logs, stones, or boards, and in angles of windows and shutters. They are commonly found in dumps and in rural areas such as farms and plant nurseries where they frequent barns, sheds, outhouses, and equipment storage areas. 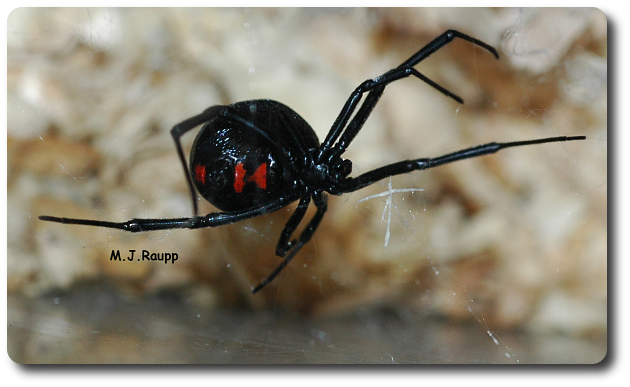 Bright red hour glass - shaped markings are a sure sign that this spider is a black widow. Like most spiders the fangs of the black widow are used to capture prey and the venom injected through the fangs helps to subdue the victim. Also like most spiders, black widows are not aggressive and bite humans only when harassed or accidentally pinched or grabbed. The bite of the widow is usually painless or felt as a pin-prick. The more serious symptoms of the bite first appear within 30 minutes to two hours after the bite. These include back pain and muscle cramps that can be severe, rigid muscles in the abdomen, nausea, and vomiting, sweating, restlessness and, in some cases, elevated blood pressure. These symptoms are most severe after 3 hours but may persist for many days. 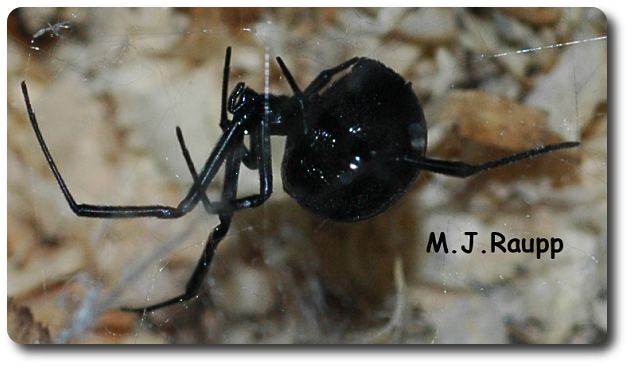 Black widows do not discriminate among their human victims and envenomation can occur in people of any age. However, the greatest number of bites is reported in children and young children appear to be at the greatest risk of receiving a lethal bite. Complications associated with black widow bites are greatest for the very young, the very old, and persons with cardiovascular disease. The death rate from documented bites occurs in less than 1% of reported cases. Rapid treatment with an antivenin and other medication can greatly reduce the severity and duration of symptoms associated with a black widow bite. Unlike other spider bites such as those from the brown recluse that we will visit in a future Bug of the Week, there is no necrotic skin lesion at the site of the bite. The actual incidence of envenomation from black widow spiders is not known but in Texas between 1998 and 2002, 760 black widow spider bites were reported. 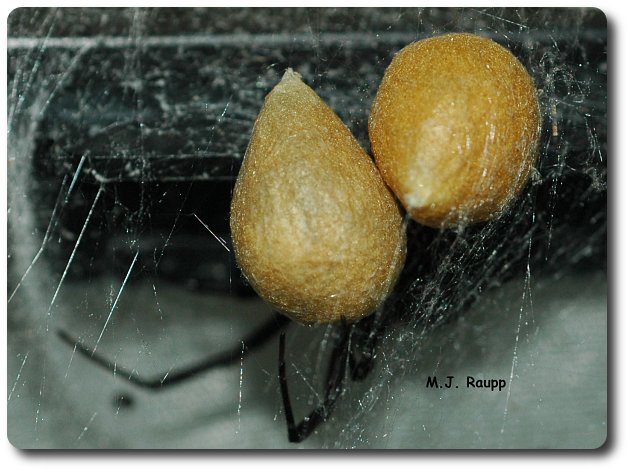 Our black widow, Angelina, recently presented us with two fine egg sacs. We are anxiously awaiting the birth of many tiny widows. To avoid bites of black widows and other spiders wear gloves and long sleeved shirts when you work in areas that might house spiders. Try to reduce clutter such as brush piles, vegetation, trash, and rubbish where spiders might hide outdoors. Do the same for furniture, sports equipment, and cloths indoors. Carefully inspect these items before moving them and store them in containers or sealed bags whenever possible. If you are bitten by a spider, try to collect the spider whether alive and intact or dead and pulverized. This will help a trained arachnologist identify the offending arthropod and help direct the course of therapy. If you or your child is bitten by a black widow spider, seek medical attention immediately. Finally, despite its name, the black widow does not always eat her mate. In fact, in some species of widows the male actually brings food to his mate. What a guy! Special thanks to Ellery and Pragnesh for sharing their spider adventure with us. The great spider book Biology of Spiders by Rainer Foelix was used as a reference for this Bug of the Week. To learn more about black widow spiders and their bites, please visit the following web sites.